Two days ago I walked into the bathroom and noticed that the toilet paper roll was empty. I removed the cardboard core from the toilet paper spindle and replaced it with a new roll. The stereotype that men never replace the toilet paper is so pervasive that I’ve got to think I’m not the only woman who is her household’s only toilet paper changer. I don’t really mind doing this, but I am of the philosophy that if you use the last of the toilet paper, you should change it out. It seems like common courtesy! 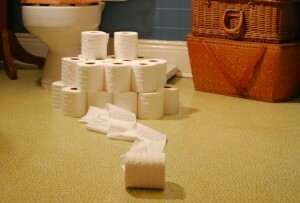 Home security: Keep plenty of toilet paper on hand. But sometimes it’s also a vitally important status check. If you use the last of the toilet paper and don’t change the roll, you might be leaving the next person to find out the hard way that there isn’t any more toilet paper. Everyone’s had that sinking feeling when they reach for paper that isn’t there and then realize with growing horror that the bathroom is completely devoid of it. If the last person had attempted to change out the empty roll, this critical state of affairs would have been discovered before it was too late! But in this case, we had one roll left. This was unusual because we always buy a huge megapack by the time we’re down to the last package. But the low supply had somehow managed to escape our attention. I thought maybe the kids had run out of toilet paper in their bathroom and come and taken our last package (how could I have not noticed the empty cupboard otherwise?? ), but upon doing reconnaissance, I discovered that the kids’ bathroom was in even worse shape than ours. They had half a roll left with no spares. And they apparently hadn’t noticed this situation, either. It’s as if toilet paper thieves hit our house. This escalated the situation from “add toilet paper to the grocery list” to “I better go to the store now.” We usually buy toilet paper at Costco or Sam’s Club, but a toilet paper run didn’t seem worth it in this case because both are a fairly long drive from our house. So I thought I’d just buy a four-pack to tide us over a couple of days until our next excursion. 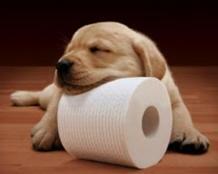 The Cottonelle puppy is a lot cuter than the Charmin bears. In the local store’s toilet paper aisle, I was surprised to find that there were almost no four-packs offered. I’m a frugal person, but good toilet paper is one of my indulgences, and the only kinds available in four-packs were the really cheap kinds. I contemplated getting the 88-cent store brand rather than the smallest pack of Charmin, which was over $8, but, surprisingly, my son objected: “It’s only one ply!” Who would have thought a teenage boy would notice such a thing, and, odder still, object to it? But I figured if it meant enough to him to voice dissent (he’s usually very agreeable on most things), I ought to get the good stuff. So I had a choice between 24-roll Charmin and 60-roll Charmin. Neither package actually has that many rolls, of course. Procter & Gamble calls what appears to be a normal-size roll a “double” roll, so a 12-pack is billed as being the “equivalent” of 24 rolls. I took note that one double roll has 176 squares, so P&G must allot a paltry 88 squares to a “single” roll. But since it appears that they no longer sell single rolls, I can’t confirm this. I’m sure they must have sold them that way for at least a while so that they wouldn’t get in trouble with the FTC for billing normal-sized rolls as double rolls. When did rolls of toilet paper get so small? Men's idea of a toilet paper holder. Noting that the 30-roll 60-roll was about the same price as they sell it for at Sam’s Club (I’ll have to check this next time we’re there), I decided to get that. Upon arriving home, I left the package (big, but surprisingly manageable for the alleged 60-roll content) in the living room to remind myself to take some to the kids’ bathroom (or to give them the chance to take the initiative and do it themselves, even if that initiative was inspired only by a totally-out-of-toilet-paper panic). But I got sidetracked, and then yesterday I came down sick and barely ventured out of bed all day. So the 30/60-pack sat in our living room the past two days without anyone (admitting to) noticing it. With its vibrant red packaging, it hardly blends in, but maybe everyone thought it was left there as a decorative touch. Not quite enough to finish the job. I thoroughly enjoyed your perspective on this sticky problem. When you are under the weather, these thngs always seem to happen. I know I would not be as forgiving for the lack of initiative. I’m surprised that the kids weren’t using the 60-roll megapack as a soft chair to watch TV, play games, or use it as a table (maybe even kick it around the house). I guess I prefer to live my life as a bit of a tyrant. I expect the worst. I assume no one will take initiative, so I always have a plan of attack. I dish out jobs, and I never take no for an answer. Of course, I am kind, thoughtful, and considerate when asking others to do something (I always say “please”), but I’ve learned to generate a piercing eye stare that leaves no doubt as my seriousness about getting things done. It gets results – and it teaches people to be more responsible. Over a period of time, my expectations are well known and few would dare not do what is expected of them. I’m not really as terrible as I sound. I simple like to take charge, get thing done, and help others to be more conscientious of taking initiative and being responsible.